CBT indicates cognitive behavioral therapy; DCS, d-cycloserine; ICBT, Internet-based cognitive behavioral therapy; and OCD, obsessive-compulsive disorder. A-F, Adjusted mean scores on the clinician-rated Y-BOCS in patients receiving d-cycloserine (A) or placebo (B), on the self-rated Y-BOCS in patients receiving d-cycloserine (C) or placebo (D), and on the Global Assessment of Functioning for patients receiving d-cycloserine (E) or placebo (F), comparing patients receiving vs not receiving antidepressants. Error bars indicate 95% CI. Antidepressants impair symptom reduction and improvement in general functioning in d-cycloserine–augmented but not placebo-augmented cognitive behavioral therapy (intention-to-treat analyses, n = 128). A and B, Midassessment 1 is before the first intake of d-cycloserine or placebo; midassessment 2, at week 6; and midassessment 3, after the last intake of d-cycloserine or placebo. A-D, Rates of patients classified as responders or in remission at posttreatment for those receiving d-cycloserine (A) or placebo (B) and at follow-up for those receiving d-cycloserine (C) or placebo (D), stratified by antidepressant medication status (intention-to-treat analyses, n = 128). Treatment response is defined as a 35% reduction in Yale-Brown Obsessive Compulsive Scale score from pretreatment to posttreatment and follow-up. Remission status is defined as a score of 12 or lower on the Yale-Brown Obsessive Compulsive Scale. Much or very much improved status corresponds to scores of 1 or 2 on the Clinical Global Impression–Improvement. First MB, Gibbon M, Spitzer RL, Williams JBW, Benjamin LS. Structured Clinical Interview for DSM-IV Axis I Disorders (SCID-I) (Swedish Version). Danderyd, Sweden: Pilgrim Press; 1999. Baer L, Blais MA. Handbook of Clinical Rating Scales and Assessment in Psychiatry and Mental Health. New York, NY: Humana; 2010. Guy W, ed. Clinical Global Impressions. Rockville, MD: US Dept of Health & Human Services; 1976. American Psychiatric Association. Diagnostic and Statistical Manual of Mental Disorders.4th ed, text revision. Washington, DC: American Psychiatric Association; 2000. Importance It is unclear whether d-cycloserine (DCS), a partial N-methyl-d-aspartate agonist that enhances fear extinction, can augment the effects of exposure-based cognitive behavioral therapy (CBT) for obsessive-compulsive disorder (OCD). Objectives To examine whether DCS augments the effects of CBT for OCD and to explore (post hoc) whether concomitant antidepressant medication moderates the effects of DCS. Design, Setting, and Participants A 12-week, double-blind randomized clinical trial with 3-month follow-up conducted at an academic medical center between September 4, 2012, and September 26, 2013. Participants included 128 adult outpatients with a primary diagnosis of OCD and a Yale-Brown Obsessive Compulsive Scale (Y-BOCS) score of 16 or higher. Concurrent antidepressant medication was permitted if the dose had been stable for at least 2 months prior to enrollment and remained unchanged during the trial. The main analysis was by intention-to-treat population. Interventions All participants received a previously validated Internet-based CBT protocol over 12 weeks and were randomized to receive either 50 mg of DCS or placebo, administered 1 hour before each of 5 exposure and response prevention tasks. Main Outcomes and Measures Clinician-administered Y-BOCS score at week 12 and at 3-month follow-up. Remission was defined as a score of 12 or lower on the Y-BOCS. Results In the primary intention-to-treat analyses, DCS did not augment the effects of CBT compared with placebo (mean [SD] clinician-rated Y-BOCS score, DCS: 13.86 [6.50] at week 12 and 12.35 [7.75] at 3-month follow-up; placebo: 11.77 [5.95] at week 12 and 12.37 [6.68] at 3-month follow-up) but showed a significant interaction with antidepressants (clinician-rated Y-BOCS, B = −1.08; Z = −2.79; P = .005). Post hoc analyses revealed that antidepressants significantly impaired treatment response in the DCS group but not the placebo group, at both posttreatment and follow-up (clinician-rated Y-BOCS: t62 = −3.00; P = .004; and t61 = −3.49; P < .001, respectively). In the DCS group, a significantly greater proportion of antidepressant-free patients achieved remission status at follow-up (60% [95% CI, 45%-74%]) than antidepressant-medicated patients (24% [95% CI, 9%-48%]) (P = .008). Antidepressants had no effect in the placebo group (50% [95% CI, 36%-64%] remission rate in both groups). Conclusions and Relevance The findings suggest that antidepressants may interact with DCS to block its facilitating effect on fear extinction. Use of DCS may be a promising CBT augmentation strategy but only in antidepressant-free patients with OCD. One area that has not been investigated clinically, to our knowledge, is whether DCS interacts with antidepressant medication. Long-term administration of different classes of antidepressants downregulates NMDA receptor subunits as well as the strychnine-insensitive glycine regulatory site to which DCS binds.15 Long-term exposure to imipramine hydrochloride abolishes the normal DCS-induced facilitation of fear extinction in rats,16 and the magnitude of DCS-facilitated virtual reality therapy for posttraumatic stress disorder was smaller in patients receiving psychotropic medications such as selective serotonin reuptake inhibitors.17 Such observations persuaded us to investigate the possible moderating effect of antidepressant drugs in humans. This double-blind randomized clinical trial was adequately powered to test the hypothesis that DCS-augmented CBT would lead to greater symptom reduction at posttreatment and follow-up compared with placebo in patients with OCD. We used a previously validated therapist-guided Internet-based CBT (ICBT) protocol for OCD that has been shown to be highly effective despite requiring only a fraction of therapist time.18-20 The main benefit of ICBT is that it is a highly structured treatment in terms of content and context of delivery, and this high degree of standardization minimizes the risk of therapist drift.21 Furthermore, ICBT removes many of the usual geographical and practical barriers that make access to CBT difficult, making it easier to do large-scale trials within a short time.22 In a post hoc exploratory analysis, we also investigated whether the effects of DCS were moderated by concomitant antidepressant medications, as suggested earlier. This study used a double-blinded experimental design with 2 groups. All patients received ICBT during 12 weeks and were randomized (1:1) to receive either 50 mg of DCS or placebo capsules 1 hour before each of 5 ERP tasks that took place during 5 consecutive weeks (Figure 1). The full trial protocol is available in Supplement 1. Clinician assessments were carried out at pretreatment, posttreatment, and 3-month follow-up. The study protocol was approved by the Regional Ethical Review Board in Stockholm, Sweden, and by the Swedish Medical Products Agency. Written informed consent was obtained from all participants. The study was suitable for outpatients who had Internet access in the general community in Sweden, were aged at least 18 years, and had a principal diagnosis of OCD according to the Structured Clinical Interview for DSM-IV Axis I Disorders23 and a score of at least 16 on the Yale-Brown Obsessive Compulsive Scale (Y-BOCS).24 Concurrent psychotropic medication was permitted if the dose had been stable for at least 2 months prior to enrollment and did not change for the duration of the trial. This was confirmed through inspection of the electronic medical records. In addition, participants were not allowed to receive any other psychological treatment for OCD during the treatment period. Further exclusion criteria were the following: pregnancy; currently breastfeeding; bipolar disorder; psychosis; alcohol or substance dependence; physical illness that could interact with treatment (eg, porphyria, epilepsy, or hypersensitivity to DCS); renal impairment; completed CBT for OCD in the last 12 months; severe personality disorder that could jeopardize treatment participation; primary hoarding symptoms; and suicidal ideation. The study was advertised in newspapers and mental health units throughout Sweden. Interested applicants first conducted an online preselection screening (eAppendix 1 in Supplement 2). An experienced clinical psychologist then conducted a telephone interview to make a preliminary assessment of inclusion and exclusion criteria. If the applicant was deemed eligible, an additional face-to-face appointment was booked with a psychiatrist at the Karolinska University Hospital in Stockholm, who, after obtaining written informed consent, decided on inclusion or exclusion. Included patients were immediately randomized and received the 5 DCS or placebo capsules from the psychiatrist to take home. Patients were randomly assigned between September 4, 2012, and September 26, 2013, to either DCS or placebo. The randomization sequence was generated by an independent party before the first inclusion (1:1 ratio) (eAppendix 1 in Supplement 2). 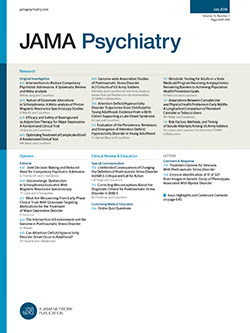 All patients received 12 weeks of therapist-supported ICBT for OCD, a treatment that has shown large effect sizes at posttreatment18,19 and sustained effects up to 2 years after treatment.20 The effect sizes of ICBT are comparable to those reported in randomized clinical trials of face-to-face CBT for OCD.6 In terms of content, ICBT mimics traditional CBT but the way care is delivered is different. In ICBT, instead of going to a clinic, the patient logs in to a secure website and works with written self-help materials and homework assignments that are closely monitored by a clinician. As in regular CBT for OCD, the main treatment component is ERP, which the patients are instructed to practice repeatedly until fear, rituals, and avoidance subside.6 The therapists in this trial were all licensed psychologists with extensive experience in treating OCD. Therapists responded to emails encrypted in the Internet platform within 24 hours on weekdays. If a patient had been inactive for 3 or 4 days, the therapist called or text messaged the patient and reminded him or her to log in as soon as possible and to contact the therapist to problem-solve any issues with the treatment. More details of this treatment are given in eTable 1 and eFigure 1 in Supplement 2. The patients self-administered the 50-mg DCS or placebo capsules within 1 hour before each of 5 specific ERP sessions. These dose, frequency, and timing decisions were based on a recent meta-analysis of DCS studies.12 When patients had completed the psychoeducation modules, they engaged in daily ERP exercises as implemented in the standard ICBT protocol. Therapists and patients had telephone contact before the first capsule was taken and cooperatively decided what ERP exercise was most suitable to combine with the drug intake. All patients received information that it was vital to carry out the ERP exercises as planned after taking DCS or placebo. Medication compliance was verified using online assessments as well as a medication event monitoring system, which is a microelectronic chip inside each medication bottle that registers date and time of each bottle opening, providing a detailed picture of adherence.25 More information about the manufacturing and quality control of DCS can be found in eAppendix 1 in Supplement 2. The primary outcome was the clinician-rated Y-BOCS, which is regarded as the gold standard for assessing the severity of OCD symptoms.27 The clinicians in this trial had several years of experience in diagnosing and assessing OCD and practiced together on videotaped case examples on 3 occasions with excellent interrater reliability (intraclass correlation = 0.98-0.99). The clinician-rated Y-BOCS was also administered before intake of the first capsule, at week 6, and immediately after intake of the last capsule. Adverse events data were collected by clinicians at midtreatment (via telephone), posttreatment, and the 3-month follow-up using a standardized checklist. Weekly online assessments of adverse events were also conducted with detailed follow-up questions. We based the power calculation on a meta-analysis12 reporting a medium effect size for DCS as an adjunct to CBT for OCD, with doses similar to those used in this trial (≤125 mg). Assuming 80% power, this study therefore needed 128 patients to detect a medium standardized mean difference (Cohen d) of 0.50 (2-tailed, α = .05). The main analysis was conducted according to intention-to-treat principles. The effects of group, time, and the group by time interaction (pretreatment, posttreatment, and follow-up assessments) were tested using a mixed-model analysis, fitted with full information maximum criteria on both primary and secondary outcome measurements.34 We used a fixed linear effect combined with a random intercept from baseline and also a random linear slope as this gave the best model fit. Ordinal and dichotomous data were analyzed using ordinal or logistic regression. Responder status was defined as a 35% reduction in Y-BOCS score from pretreatment to posttreatment and follow-up,35 and remission status was defined as a score of 12 or lower on the Y-BOCS.36 To examine the potential effect of concomitant antidepressant medication, all analyses were repeated with current antidepressant status as a factor in the model. All data were analyzed using Stata version 13.0 statistical software (StataCorp LP). The sample characteristics are displayed in Table 1 and eAppendix 2 in Supplement 2. There were no significant differences between patients who completed face-to-face vs telephone administration on any demographic, clinical, or outcome variables. As seen in the CONSORT diagram (Figure 1), we had no data loss on the clinician-administered outcomes at posttreatment and only 2% missing data points at follow-up. The corresponding proportion of data loss on the self-rated assessments was 8% at posttreatment and 5% at 3-month follow-up. There were no changes in concomitant medications or psychological treatments from baseline to follow-up. There was a main effect of time (B = −2.15; Z = −11.50; P < .001) but no effect of group (B = 0.82; Z = 0.82; P = .41) or interaction effects (B = −0.83; Z = −0.31; P = .75) on Y-BOCS scores (Table 2 and eFigure 2 and eFigure 3 in Supplement 2). Large within-group improvements were observed for both the DCS group (mean [SD] clinician-rated Y-BOCS score, 23.36 [3.53] at pretreatment and 13.86 [6.50] at posttreatment; d = 1.82; 95% CI, 1.40-2.23) and the placebo group (mean [SD] clinician-rated Y-BOCS score, 22.75 [3.80] at pretreatment and 11.77 [5.95] at posttreatment; d = 2.20; 95% CI, 1.76-2.64), and results were sustained at follow-up (mean [SD] clinician-rated Y-BOCS score, 12.35 [7.75] for the DCS group and 12.37 [6.68] for the placebo group). There were no significant between-group effects on the Y-BOCS at any assessment point (d = −0.34 to 0.00). Similarly, there were no significant interaction effects on any secondary outcome measure (P = .09 to P = .99) (Table 2). Comparable proportions of patients in the DCS and placebo groups were classified as responders and remitters according to preestablished criteria, both at posttreatment and at follow-up (eAppendix 2 in Supplement 2). Among the DCS group, 61% (95% CI, 48%‐72%) were responders and 47% (95% CI, 35%‐59%) were in remission at posttreatment; 63% (95% CI, 50%‐75%) were responders and 48% (95% CI, 36%‐61%) were in remission at follow‐up. In the placebo group, 69% (95% CI, 56%‐79%) were responders and 61% (95% CI, 48%‐72%) were in remission at posttreatment; 63% (95% CI, 50%‐74%) were responders and 50% (95% CI, 38%‐62%) were in remission at follow‐up. The introduction of antidepressant medication as a factor in the model yielded a significant interaction effect, indicating that the effects of DCS vs placebo depended on whether the patients were on antidepressants (clinician-rated Y-BOCS: B = −1.08; Z = −2.79; P = .005; self-rated Y-BOCS: B = −0.44; Z = −3.72; P < .001) (Figure 2). The same was true for the secondary measures (P = .05 to P < .001). To investigate this further, we ran separate regression analyses on each subgroup. Separate analyses within the DCS group (n = 64) showed that patients on antidepressants (n = 21) had significantly worse outcomes on both the clinician-rated Y-BOCS (B = 1.08; Z = 2.85; P = .004) and the self-rated Y-BOCS (B = 0.44; Z = 3.63; P < .001) as well as on most secondary measures (eTable 2 in Supplement 2) compared with patients in the DCS group not on antidepressants. Independent t tests showed significant between-group differences both at posttreatment (clinician-rated Y-BOCS: t62 = −3.00; P = .004; self-rated Y-BOCS: t57 = −4.23; P < .001) and at follow-up (clinician-rated Y-BOCS: t61 = −3.49; P < .001; self-rated YBOCS: t55 = 4.37; P < .001) with large between-group effect sizes (clinician-rated Y-BOCS: d = 0.80-0.95; self-rated Y-BOCS: d = 1.18-1.23). The corresponding response and remission rates are shown in Figure 3. By contrast, there were no statistically significant differences in outcome between antidepressant-treated and antidepressant-free patients within the placebo group (16 of 64 were on antidepressants), either on the clinician-rated Y-BOCS (B = 0.30; Z = 0.70; P = .48) or the self-rated Y-BOCS (B = 0.16; Z = 1.28; P = .20) (eTable 3 in Supplement 2). In the DCS group, a significantly greater proportion of antidepressant-free patients achieved remission status at follow-up (60% [95% CI, 45%-74%]) compared with antidepressant-medicated patients (24% [95% CI, 9%-48%]) (P = .008). Antidepressants had no effect in the placebo group (50% [95% CI, 36%-64%] remission rate in both groups). Response and remission rates were similar and not significantly different between the groups (Figure 3). Finally, exclusion of all patients on antidepressants revealed that the main interaction effect (using all assessment points) on the clinician-rated Y-BOCS was nonsignificant (B = −0.36; Z = −1.10; P = .27), but there was an interaction effect from posttreatment to follow-up favoring the DCS group (B = −3.25; Z = −3.28; P < .001). Both the self-rated Y-BOCS (B = −0.20; Z = −1.92; P = .06) and the Global Assessment of Functioning (B = 2.05; Z = 2.03; P = .04) suggested superiority of DCS over placebo (eTable 4 and eFigure 4 in Supplement 2). No serious adverse events were reported (eTable 5 in Supplement 2). There were no instances of emergency unblinding. This is the first adequately powered trial, to our knowledge, to examine whether DCS enhances the effects of CBT in OCD. In the main analysis, DCS did not augment the effects of CBT at any time. However, we found a highly significant interaction effect between DCS and antidepressant medication, whereby concomitant antidepressants impaired treatment response in patients randomized to DCS but not in patients randomized to placebo. Furthermore, DCS was superior to placebo in antidepressant-free patients on the clinician-rated Y-BOCS and some of the patient-rated measures. The results have important implications for both our understanding of the mechanisms of DCS in humans and the clinical use of this compound in clinical settings. The interaction between antidepressants and DCS has been previously described in the animal literature and thus is biologically plausible. Long-term administration of different classes of antidepressants downregulated NMDA receptor subunits as well as the strychnine-insensitive glycine regulatory site to which DCS binds.15 Long-term administration of imipramine interfered with the normal DCS-induced facilitation of fear extinction in rats.16 Fear extinction in rats is dependent on NMDA 2B receptor subunits in the amygdala, and long-term, but not short-term, administration of citalopram hydrobromide decreased fear extinction accompanied by decreases in the expression of NMDA 2B receptor subunits.40 The intriguing finding of our study suggests that DCS may act as a partial antagonist at the glycine regulatory site after long-term use of antidepressants. For clinical researchers, the results suggest that patients receiving antidepressants should be excluded from future DCS trials. For animal researchers, our findings may encourage further studies on the mechanisms and precise conditions under which antidepressants interact with the NMDA receptor. In turn, this information may inform further clinical research. For example, for how long should patients be off antidepressants for DCS to be optimally effective? Is DCS better indicated for antidepressant-naive patients? Do all types of antidepressants interact with DCS? One potential limitation of our study is that the results may not be generalizable to the entire population with OCD, as the patients were self-referred. However, most had been ill for many years and had had previous contact with treatment services. Another potential limitation is that the patients took the DCS or placebo capsules at home rather than at the clinic. However, we went to great lengths to monitor treatment compliance, using both the log from the medication monitoring system and that from the weekly medication reports. We therefore view this risk as small, and potential instances of noncompliance would have been equally distributed in the 2 treatment arms. A final limitation is that the medication interaction results originated from post hoc analyses. Although the medicated and unmedicated groups did not differ on either OCD or depressive symptoms at baseline and were equally compliant with ERP homework assignments, the observed interactions may be caused by other spurious, unmeasured variables. We consider this unlikely, but our results will require independent replication. d-Cycloserine did not augment the effects of CBT but showed a significant interaction with antidepressant medication, suggesting that antidepressants may interact with DCS to block its facilitating effect on fear extinction. This should be investigated further. Corresponding Author: Christian Rück, MD, PhD, Karolinska Institutet, M46, Karolinska University Hospital Huddinge, 141 86 Stockholm, Sweden (christian.ruck@ki.se). Submitted for Publication: December 10, 2014; final revision received February 28, 2015; accepted March 24, 2015. Published Online: May 13, 2015. doi:10.1001/jamapsychiatry.2015.0546. Author Contributions: Drs E. Andersson and Rück had full access to all of the data in the study and take responsibility for the integrity of the data and the accuracy of the data analysis. Study concept and design: E. Andersson, Hedman, Ljótsson, Svanborg, Mataix-Cols, Kaldo, G. Andersson, Lindefors, Rück. Acquisition, analysis, or interpretation of data: E. Andersson, Hedman, Enander, Radu Djurfeldt, Ljótsson, Cervenka, Isung, Svanborg, Mataix-Cols, Kaldo, G. Andersson, Rück. Drafting of the manuscript: E. Andersson, Hedman, Enander, Radu Djurfeldt, Ljótsson, Svanborg, Kaldo, Rück. Critical revision of the manuscript for important intellectual content: E. Andersson, Hedman, Radu Djurfeldt, Ljótsson, Cervenka, Isung, Mataix-Cols, Kaldo, G. Andersson, Lindefors, Rück. Statistical analysis: E. Andersson, Hedman, Ljótsson, Rück. Obtained funding: E. Andersson, Mataix-Cols, Rück. Administrative, technical, or material support: E. Andersson, Hedman, Radu Djurfeldt, Svanborg, Kaldo, Rück. Study supervision: E. Andersson, Enander, Radu Djurfeldt, Mataix-Cols, G. Andersson, Lindefors, Rück. Conflict of Interest Disclosures: Drs Hedman and Ljótsson are shareholders of Dahlia, a company specializing in psychiatric symptom assessment. Dr Ljótsson is additionally a consultant for Almirall. Dr Cervenka has received grant support from AstraZeneca as coinvestigator and has served as a one-off speaker for Roche and Otsuka Pharmaceuticals. No other disclosures were reported. Funding/Support: This study was supported by the Swedish Research Council and the regional agreement on medical training and clinical research between Stockholm County Council and Karolinska Institutet. Additional Contributions: Sahar Gaveli, MSc, and Julia Boberg MSc, Karolinska Institutet, Stockholm, Sweden, provided administrative assistance; they received compensation from Karolinska Institutet. Monica Hellberg, RN, Stockholm County Council, Stockholm, also provided administrative assistance; she received compensation from Stockholm County Council.